By now, it should be common knowledge that Yeti is the cooler brand that is absolutely setting the bar for everything “premium” at this point. Although this is true, a lot of people are turned off by the price. This is fair, I think, as not everybody can afford to pay premium rates. 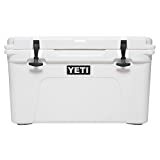 Naturally, competition has emerged, and many coolers on the scene are very closely, sometimes suspiciously closely, emulating the features and style of the Yeti. That’s the nature of things, but there is a pretty huge range in quality within the “clones” of the Yeti. To be honest, some just are not very good coolers. The products offered up by RTIC, on the other hand, are pretty darn good. It’s a bold statement by RTIC, and their plan may end up benefitting them. But we’re not here to discuss legalities, are we? No, we’re here to discuss coolers. Here is my dissection on which company manufactures and distributes the better cooler. I’ll do my best to remain unbiased! Let me begin by saying that RTIC has basically created their “version” of every product in Yeti’s line, so these truths are generally the same for each product; the specifics of certain sizes will change in scale, though the ratio will likely remain the same! For this article, I decided to test using my Yeti Tundra 45 and my friend’s RTIC 45, and I did some independent research, as well! Okay, so the first thing we noticed is that the RTIC 45 actually holds quite a bit more ice than the Yeti Tundra 45, which was pretty odd, considering they seem near identical in size. Now, I’d heard that the RTIC coolers actually outperform the Yeti in these regards, so I was not surprised when his lasted almost 6 days, while my ice lasted only 5. Of course this is variable, but I am willing to give it to RTIC that they have slightly better ice retaining abilities. Obviously my friend gave me quite a hard time about this. Which makes some sense, considering he payed hundreds less than I did. But I was quick to remind him that, in the big picture, they both have quite amazing ice retaining abilities, and that there are more categories than Ice retention that would be determining which was the more valuable cooler! Verdict: RTIC. I knew this would be an interesting category. Yeti has the revolutionary design, and RTIC is the best copier and adapter to that design. 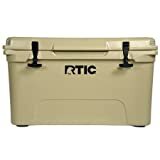 RTIC has literally pulled every trick in the book to create a cooler that is “as good” as Yeti for half the price, and I can say that the differences are noticeably difficult to put a finger on. Similarities include impressive rotomolded construction, high quality latches, significant insulation within the walls, heavy duty foam, and other impressive hardware. Actually, there were few enough differences between the two that we had quite a difficult time picking a winner. My friend suggested flipping a coin, but I think that Yeti’s engineers and designers deserve the benefit of the doubt for being the originators of such a desirable concept. He countered that, although my statement is true, similar praise should be given to the folks at RTIC for being resourceful enough to make such a comparable product in a much less expensive way. Verdict: Yeti. Not to mention, Yeti products are available in a much wider range of colors and styles, whereas the selection for RTIC products is considerably slimmer and less inventive. 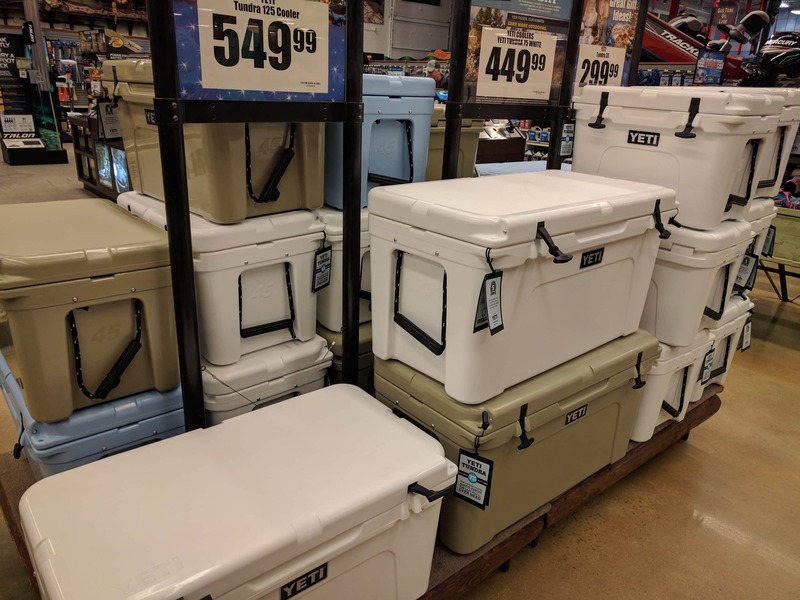 Although aesthetics like this are not “make or break” in your cooler decision, the vast selection offered by Yeti certainly functions as a reasonable tiebreaker between the products. My friend begrudgingly agreed. Verdict: Yeti. This one is easy. Yeti offers a 5-year comprehensive warranty, whereas RTIC’s is only 3 years. Verdict: Yeti. Again, this is an easy category, but not as black and white as the previous. Yeti is the master, RTIC is the student attempting to outsmart their master. It’s an interesting dynamic, because the biggest negative contributor to Yeti’s reputation is their high price, which RTIC amends quite impressively and skillfully. Still, Yeti is the biggest name in the game, and RTIC may have gotten a spike in popularity from the lawsuit that Yeti brought against them, which may have helped their sales, but certainly did not boost their reputation professionally. Verdict: Yeti. Okay, obviously I think the Yeti is the superior cooler in almost every way. But the fact that your common Yeti product is often 130%-170% more expensive than the comparable RTIC is a substantial consideration you should be taking to mind. For me, I think that RTIC’s methods of copying and emulating are a little bit suspect, and I support the integrity and legitimacy of Yeti’s operations. As you can see, Yeti has a slight in advantage of most of these quantifiable categories, too. But if you are looking for a less expensive solution, RTIC offers the best clone of a Yeti on the market, hands down, in my opinion. And, as I learned through this experiment, the RTIC actually handles and retains ice in a slightly more impressive and efficient manner than the Yeti, which was genuinely surprising. Through this investigation, my respect for the RTIC product definitely increased, and I am genuinely impressed that they are able to have such an efficient operation that they can sell premium quality coolers at such an affordable rate. But, in my opinion, and that of many enthusiasts and professionals, there is still no cooler manufacturer that delivers the whole package as successfully as Yeti. When you are the model that your competitors are using as their model to base their engineering around, you must be doing something right. For some time now, Yeti has held the torch, and I don’t see that stopping anytime soon. Is A Yeti Cooler Worth It? ← Is A Yeti Cooler Worth It? 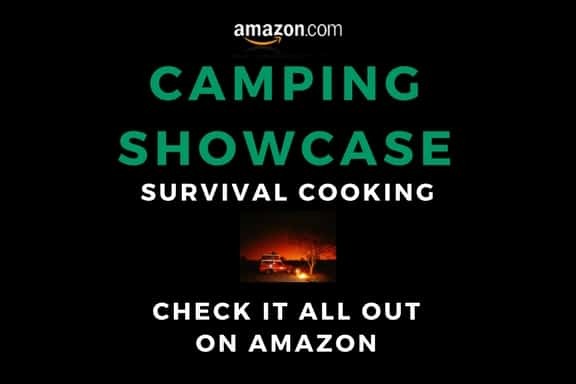 With the summer months finally here, my husband and I are in need of getting a new cooler for all of our boating and camping trips. We would like to get a Yeti cooler, but are curious to know if this is the right brand for us to be getting. I like how you pointed out that when it comes to the build of this particular cooler is that it comes with high quality latches, and significant insulation. These things help make it perfect for keeping things cold on those long hot summer days.